On October, 21st our big ArcheRage family is celebrating server's 1st Anniversary. Though it's our first one, we are sure, not the last. Many projects, events and funny moments are waiting for us ahead. But let's look back into the past and remember events, funny and not-that-funny battles, days we first met our friends here and multiple other things. 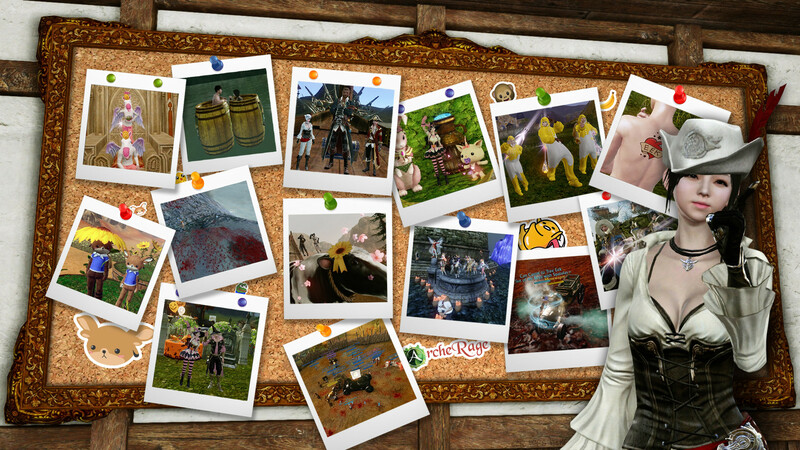 Unite your bright memories about the server you had during the passed year in one collage (include as many screenshots into it as you want). Last day of the event - November, 5th. First first ArcheRage launch memorie... I remember, I just asked for my mim Credit Card to donate and get my 16x16 farm and run for my place. Don't have a screenshot, but got a good memory, Who remembers <WANTED>? The early days of ArcheRage were amazing, miss the 5 way kraken fights. Hey I'm in this video.... I'm famous. Mom get the camera. I remember that time G O D H A T E S W E E B S beat Welcome. Loved the game! This is the collage of me ! with my friends, Building a boat, Fishing, Fun purpled pvp (im the dead one) and also some cool stuff like the scenery of killing world boss, crimson Rift + bonus cool view after war of the Mistemarrow battle. This game really have lots of contents its really overwhelming! Vexeris and myooteme like this. I love this server. Some memories: My first ship battle, watching two pirate ships come towards us as we were trying to escape from a third and knowing there was no way we'd survive; relaxing at the Belching Beaver while waiting for the party to start and hanging out at the bar with the Beartender; sailing around the ocean because it's so pretty; my very first thunderstruck tree ever; some of my pets; and a picture of this Nuian fellow who instead of killing us took me and my friend on an epic adventure across the world when we were still leveling. We explored mountains, sailed across the ocean, went to Freedich, and took a crazy speedboat ride down the waterfalls through Rookborne Basin into a huge crash and burn at the bottom in Windscour. I forget your name, friend, but that night is one of my favorite memories of this server. ArcheRage.. I started in november last year a bit skeptical after playing several years on Live..
Ofcourse we started all over again. Castle sieges.. We won some we lost some and we won some again. This is Archerage for me in a few words.. Friendship, PVP, Naval combat, Worldbossess.. and secretly Bloodlust. Happy anniversary!! You people are amazing and I hope to stay here for a long time! Zenais, Insidiouschicken and Einaer like this. Zenais, ToastedBabyBuns, Einaer and 2 others like this. Happy 1st Anniversary ArcheRage! I've only been on the server for less than two months but thank you for allowing me, Choi of Haranya, to have a fun experience and get into plenty of shenanigans with Keatra in a populated server with free patron and quadruple labor! 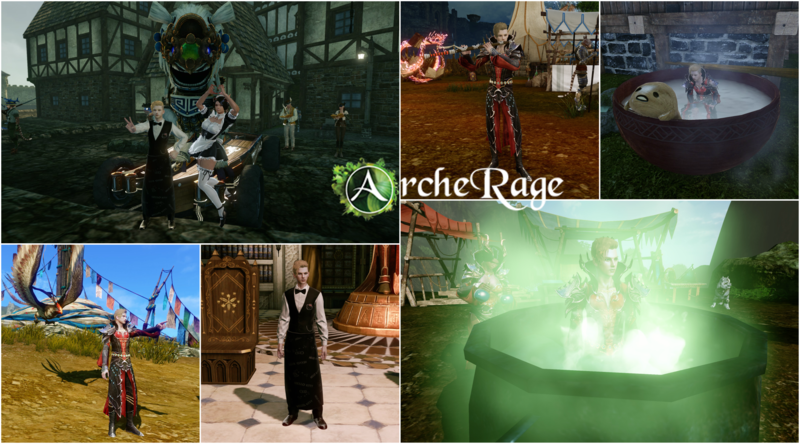 Thanks for the fun screenshot contests that let me express my creativity and have a chance at good prizes too I hope to be here for the 2nd Anniversary and can't wait to see what you guys bring us in the future of ArcheRage! 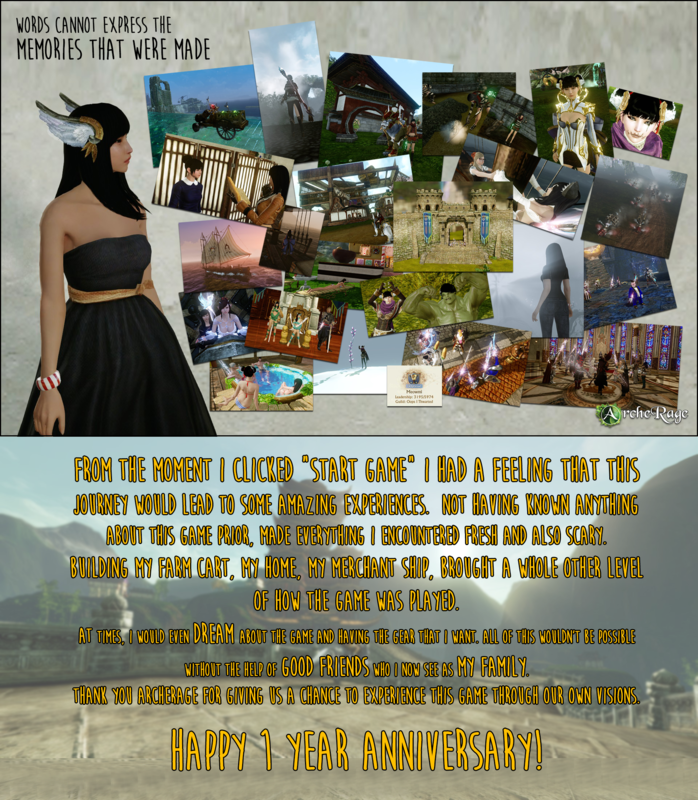 First off, I'd like to wish a very happy anniversary to everyone here, both players and devs. I also want to thank everyone involved in creating this server, because I never thought I'd be back in this game again once I left Live. It was my first dive into mmos, and like they say, your firsts will always have a place in your heart. I'd also like to thank the devs for taking time out of their lives to create more content for us with the custom quests and forum competitions. The stories in the quests are enjoyable, and I'm appreciative towards you for the rewards as well. I look forward to more stories and events, whenever you decide to make them. 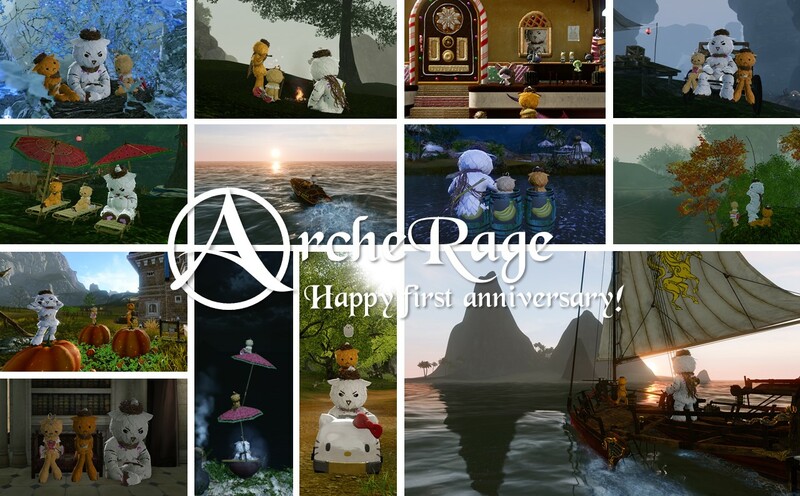 I'll be true to my guild name and stop my rambling here, otherwise this post will be neverending, but I'd like to say once again, happy anniversary, ArcheRage. Thank you for the happiness and salt for some people you've given us, and I look forward to many more anniversaries to come. -Vexeris, a Westie from <Say Less>. Zenais, Triexx, Meus and 1 other person like this. Hello! You may have heard of me- my name is Tankup, of the world famous muppet duo! You may recognise me by my LARGE and STRONG body! I first left my home village in Villanelle around 4 months ago in order to start a new home with my muppet partner. Our new village location is a secret! We have built it over a long time now and filled it with our precious possessions! The muppet family goes on many adventures and we have explored far and wide! You can often find us bringing entertainment in Austera and upholding the duty of being cute! This muppet is lucky to have made many friends in this world Even while exploring the far reaches of Miroir Tundra there was someone there to become muppet friend! Zenais, Triexx, norhi and 5 others like this. Hi everyone! After finally quitting live servers, Peep and I were hesitant to give ArcheRage a shot. One year later, we could not be happier with our decision to play here! From East, to Player Nation, and now as a Pirate, we have made many new friends and memories. Although the content is not new for some of us, there are many people on this server that have never played this game before. Experiencing ArcheRage together with both old and new players is so refreshing! Thank you to the ArcheRage team for listening to the community and trying their best to provide a better experience for us. Seleen, Vexeris, Peep and 1 other person like this. Event is closed. Results tomorrow. Thank you all for gathering the memories of the year!